Terrier breeder Captain Jean Heath is legendary in the world of show dogs. Join us for our conversation about her dog breeding and showing career, and her famous business partner, Bill Cosby. Jean, what was the first dog you ever owned? My first dog was a Scottie-mix, named Spikey. It came from my brother when I was five years old. How did you become a terrier breeder and get involved in the world of show dogs? Well, I had one dog for about my first seven years, a Miniature Schnauzer, and bred her, but she didn't conceive. So, I was given the opportunity to co-own another dog. That was in 1967. When she was bred, there were four puppies to share with the co-owner. All four finished their championships and I owned two of them. That was my real start. You're famous for your involvement with Terrier breeds, but have you ever shown any other types of dogs? Well yes, we've shown Miniature Schnauzers, but we've shown a lot of Lakeland Terriers. We have 26 "Best In Show" Lakeland Terriers. We've bred about 200 champions so far. Do you breed all of your own show stock, buy promising prospects, or both? What is it about Terriers that has earned such devotion from you? I don't know; I just like them. There are a lot of types. They're intelligent. I like their size, of course. They're built for house dogs. I like other features too, like they don't shed, no general doggie-odor. They're easy to manage. What is your ideal of the perfect Terrier? As a Terrier breeder, I think our latest winner "Harry" is pretty close. Overall, his features are about as close to perfection of the standard we have seen. Who are some of your own favorite show dogs of all times? I especially liked Champion Schlosshaus's Jo-Jo-Dared, and Champion Black Watt Dolby Tucker. Then there was Champion Black Watt Awesome Blossom, the top winning Lakeland of all time. Are there any particular show dogs that you've especially admired that you didn't own or breed? There've been so many over the years. I couldn't begin to tell you. Many different breeds. If you had to choose just one win as your all-time favorite, which one would it be, and who was the dog? I would say the American Kennel Club's very first National Invitational, and that was in Maryland, in 1992. 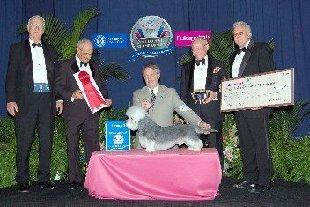 It was AKC's first national dog championship and we won with Champion Black Watt Dolby Tucker. Now we can't talk about your career in show dogs without mentioning your celebrity partner. How did you and Bill Cosby meet? Well, he was my patient and my foreman in the Navy. How long have you been working together in dogs? Which one of you was actually into show dogs first? That would be me. I took my first Miniature Schnauzer to work, and he and Bill worked together. Anyway, when Bill and I had our reunion in 1972, I was still on active duty in the Navy, and he decided we would become partners. What role do each of you play in your partnership? I do managing generally, and he provides the financial backing. He's like the cheerleader of the club. We call him a benefactor. Who chooses which dogs to promote, and how is that decision made? What do you think has been the key to this partnership's success? Well, for Bill and me, it's our friendship, and our trust and our belief in each other, you know. We have great people who take care of the dogs, who condition the dogs, who present the dogs. Tell us about your experience at the 2006 National Dog Show. Well, I didn't get to see a lot of it, because I was in the booth for Lakeland Terriers for Best of Breed, but we won Best of Breed in Lakelands and in Dandie Dinmonts. We did get to see the Groups later on though. Who do you think is your next great show prospect to watch for? We have a new Lakeland Terrier coming up. Her name is Miss Madison, so watch for her. Can you foresee a day when you'll retire from dogs? That's wonderful because we couldn't imagine the show dog world without you.